Note: If you have any trouble following along, you can download the completed AppleScripts and Automator workflows here. 1. 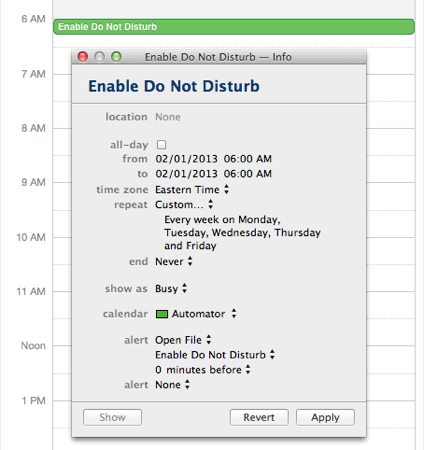 Launch Automator (in your /Applications folder) and create a new Calendar Alarm workflow. 2. Search the action library for the Run AppleScript action and drag it to the workflow area. The script writes to Notification Center's property list file and enables Do Not Disturb mode. It then quits and relaunches Notification Center in order for the change to go into effect. 4. You're finished building the workflow, so go ahead and save it as Enable Do Not Disturb. 5. When you save the workflow, Automator puts it where it needs to go (the ~/Library/Workflows/Applications/Calendar folder). The Calendar app launches and a new event is created in an Automator calendar, which Automator creates if it doesn't already exist. 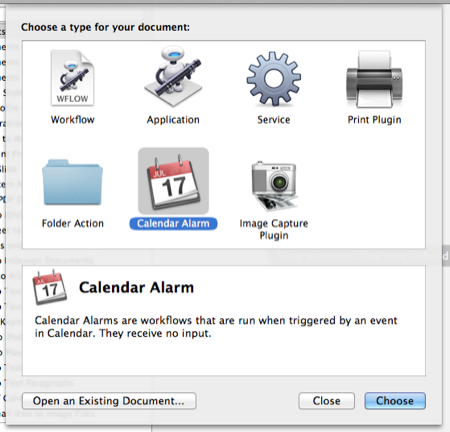 The event should be configured with an Open File alarm that's set to run the workflow. Schedule the event for the desired time, such as every weekday morning at 6 AM. 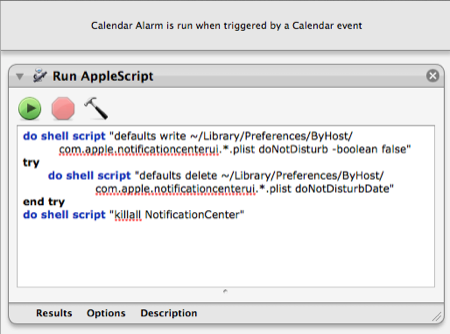 Now, every time the event occurs, the alarm should launch the workflow and Notification Center should be disabled. As I mentioned earlier, Notification Center automatically re-enables each day at midnight. So, if you plan to schedule Do Not Disturb overnight, then you'll need to create an additional event that disables it again at 12:01 AM. Now that you've got a workflow to disable Notification Center, you probably want one to re-enable it. 1. 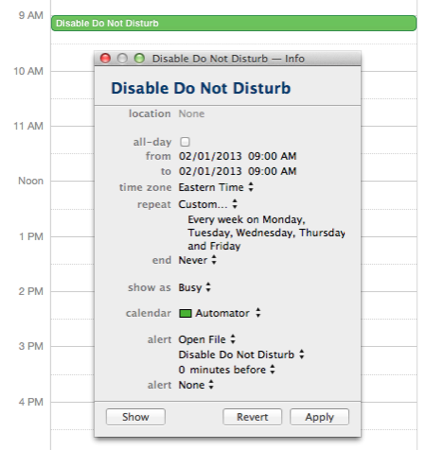 Create another new Calendar Alarm workflow in Automator. 2. Search the action library for the Run AppleScript action again and drag it to the workflow area. This code updates Notification Center's property list file to disable Do Not Disturb. Then, it relaunches Notification Center for the change to take effect. 4. The workflow is done, so save it as Disable Do Not Disturb. 5. 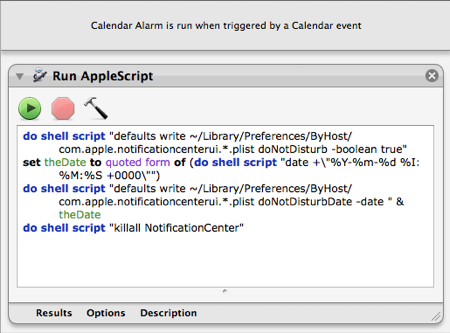 The Calendar app should launch again and another event should be added to the Automator calendar. This event should be configured with an Open File alarm that's set to open the Disable Do Not Disturb workflow. Set it to run on the desired schedule, such as every weekday morning at 9 AM. If everything has gone according to plan, you should now have Do Not Disturb workflows that disable and re-enable Notification Center alerts and banners at the desired times. Use your alert-free time wisely. Until next time, happy scripting!